We know that we have issues in this country with social studies instruction, and it is especially challenging at the elementary level. Whether we are talking about the impact of assessment on instruction, the weakness of the content-based resources, or simply the loss of time devoted to and disappearance of social studies from the elementary curriculum, it has an impact that is simply not debatable. When social studies is marginalized, it robs students of the opportunity to develop the knowledge, skills, and dispositions they need to be effective and engaged citizens. We simply cannot expect success and engagement when many kids don't start learning about civic life and engagement, and everything that goes into it, until well into middle school or even high school. Social studies matters. We have an obligation to ensure that it is being taught with fidelity and with passion. As Dr. Tina Heafner argued in her keynote at the Florida Council for the Social Studies' recent conference, effective and quality social studies instruction is the right of all students. 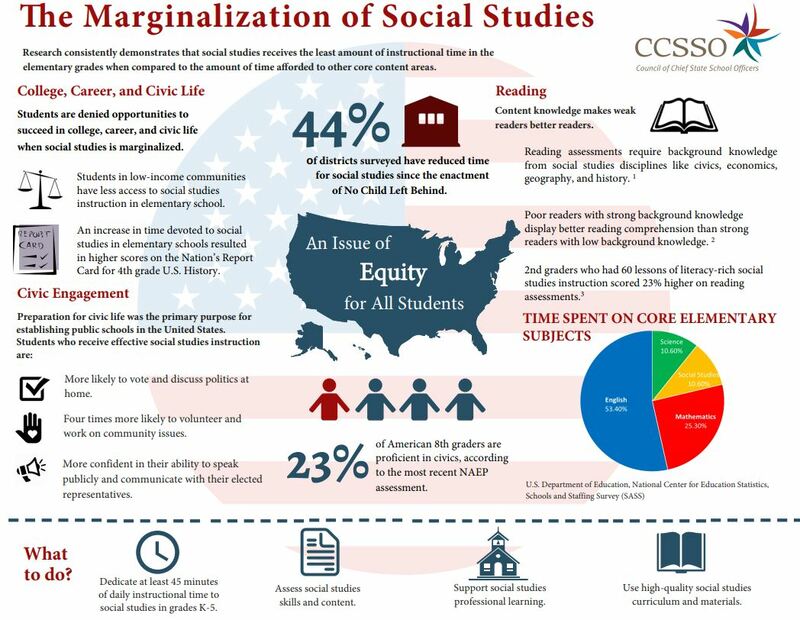 The Social Studies Collaborative, a working group made up of members of the Council of Chief State School Officers, has recently released an infographic, featured at the top of this post, that illustrates both the disturbing data on the marginalization of social studies AND the positive benefits of social studies instruction that can result when we return our beloved field to the prominence it deserves. We here at the Florida Joint Center for Citizenship and the Lou Frey Institute support and believe in this message completely. We need to bring social studies back to the elementary schools. We need it to ensure that our students become the best citizens they can be. And it needs to, and CAN, start in Kindergarten. FJCC even has some short civics-oriented lessons that can be done in about 15 or 20 minutes and introduce social studies and civics concepts to elementary school students at all grade levels!